The Visit Harghita telephone application has been used by thousands since its December launch and the supply of the touristic application continuously broadens.This useful application is filling the blank and it is unique in its own way because it presents all the touristic supply of the county in one single place. 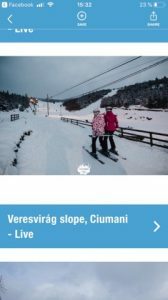 “In the past days, the platform broadened with a new service: through the app one can follow the traffic on the 13 ski slopes of the country through webcams, this way one can find out in real time about the weather conditions and about the possible crowds on the slopes helping to make a choice more easily. The skiers, beginners or advanced, have the possibility to use a great number of ski slopes in the Harghita mountains. Having a single pass they are able to race on the following slopes: the Lobogó slope in Homoródfürdő/Baile Homorod, Veresvirág in Csomafalva/Ciumani, on the Havas and Bogdan slopes in Bucin – all these can be found within a range of 100 km. The application also contains the slopes of Madarasi Hargita/Madaras Harghita, the slope of Marosfő/Izvoru Muresului, the Magyaros and Fenyő slopes of Maroshévíz/Toplita, the SkiGyimes slope of Gyimesfelsőlok/Lunca de Sus, the slope of Tusnádfürdő/Baile Tusnad, the Csipike and Miklós slopes of Hargitafürdő/Harghita Bai, the Kissomlyó slope of Csíksomlyó/Sumuleu Ciuc and also the Reménység ski center of Borszék/Borsec. The application – also designed for digital tour guidance – was realized as part of the international project INSiGHTS by the Council of Harghita County. The Visit Harghita application is freely available from App Store and Google Play. The purpose of the project is to develop the tourism of the region by showing all the offers in one single place.